We`ll Hand-Submit Your Site to Search Engines. We will hand-submit your site to the search engines so you`ll be indexed right away. Trust us. If you don`t hand-submit your site, you`ll never be indexed. And if you don`t have us keep submitting to the search engines each month, you`ll drop in rankings. 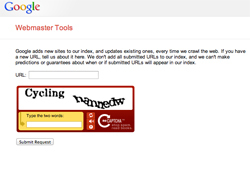 Google and other search engines mostly ignore sites that are submitted through the forms on their site. Google will often completely ignore new sites, placing them in a “sandbox.” This helps prevent fly-by-night companies from being indexed, and gives preference to companies that have stood the test of time (at least half a year). Relevant inbound links are what matter, and will get your site indexed and out of the Google Sandbox. Google spiders through other sites, and looks for links pointing to your site. If enough relevant sites link to your site, chances are good that Google will pay attention. If your site is remarkable enough for someone to write a blog post, twitter post or Facebook comment, your site will be indexed. That person is staking their personal reputation to link their friends and site visitors to your site. Google and other search engines will automatically find your site without the need for any site submissions. To get indexed, your time will be better spent focusing on obtaining links from other sites. I hope you found this SEO Myth debunked article helpful. Let us know if we can help with your search engine optimization needs.